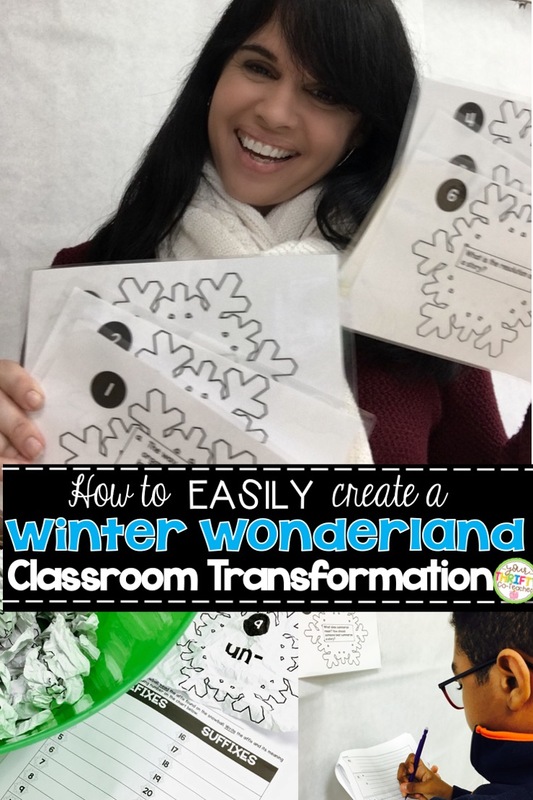 This week, I will be sharing with you how I created a Winter Wonderland classroom transformation in no time at all, and how you can use the same model to incorporate this transformation to meet your students' needs with very little effort. We were just coming back from our winter break and I knew that we had to review many of the terms and concepts we had discussed during the first half of the year. (We all know that with break comes a lot of ... well, forgetfulness.) However, I didn't want to do a packet review .... boring. 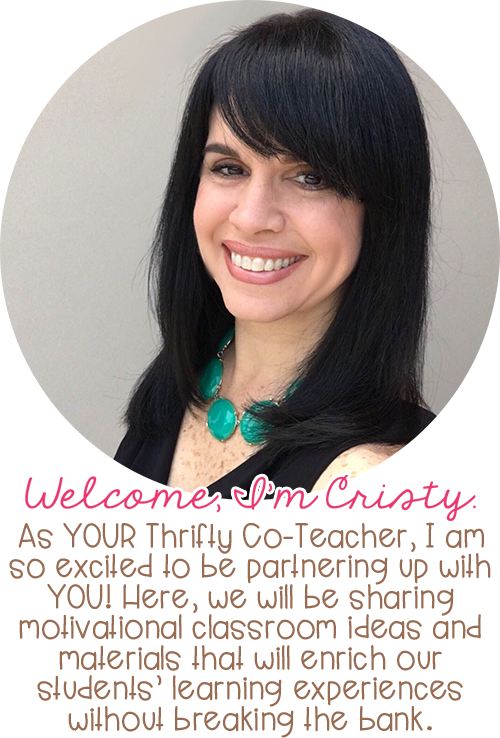 I decided that I could pretty much do a review session with the students, through an engaging classroom transformation. 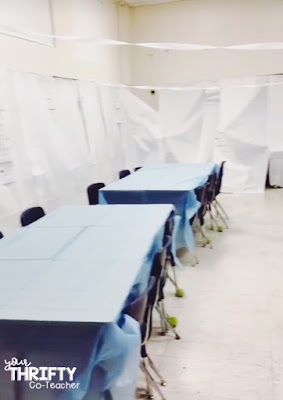 Well, I usually use plastic tablecloths from Dollar Tree for my classroom transformations, but my school had some white banner paper available for use. (Free? Yes, please!) I used it to cover some of my walls. I simply stapled the paper to the top of my wood board borders, cut the bottom of the roll, and continued throughout two walls of my classroom. 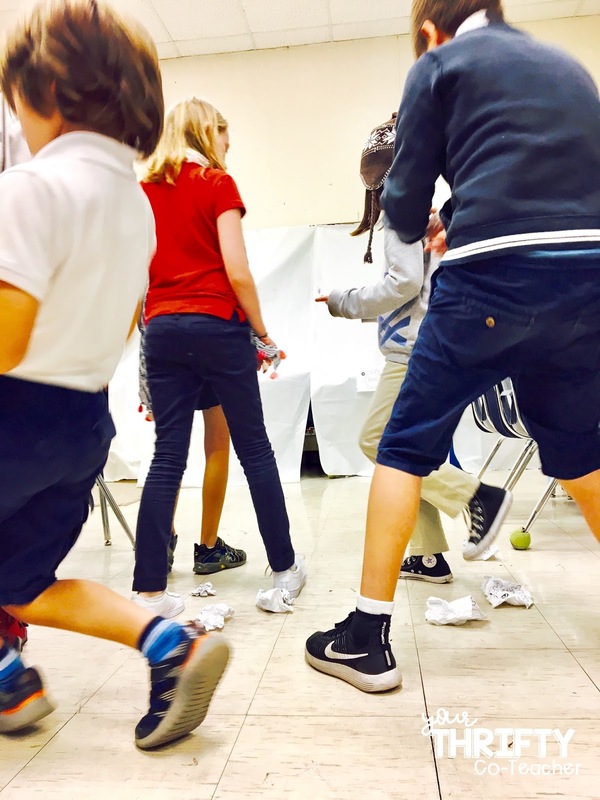 I then told the students that we would be playing winter games, and the object of the games were to accumulate as many points as possible. For each question they answered correctly, they would receive a point. THE AMBIENCE IS SET. THE STUDENTS ARE EXCITED! NOW WHAT? At my school, we have a two hour reading block, so I incorporated three engaging activities to fill up that time. 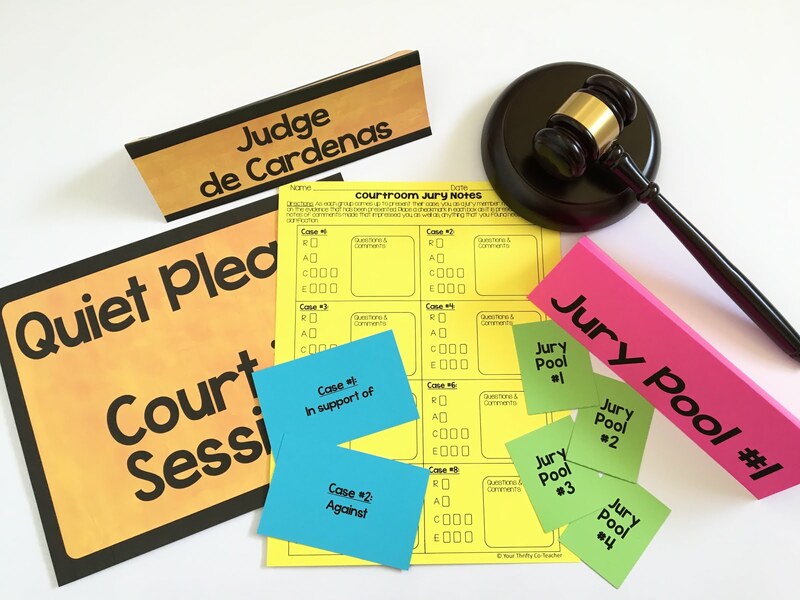 I created task cards for my students based on concepts and terms we had gone over during the first half of the year. 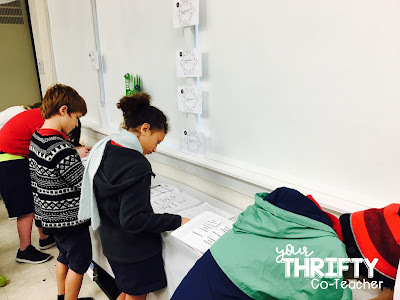 I then posted them around the room to create a scoot activity. 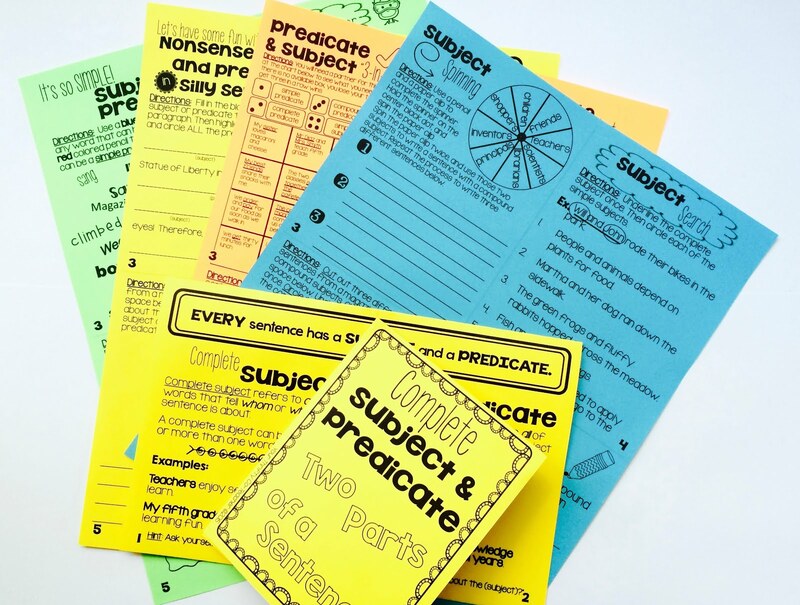 Make it your own by: finding tasking cards related to your subject matter and simply posting them up around the room. Next, I introduced the "Snowball Fight" activity, of course modeling how to throw a snowball using the under-arm throwing technique. 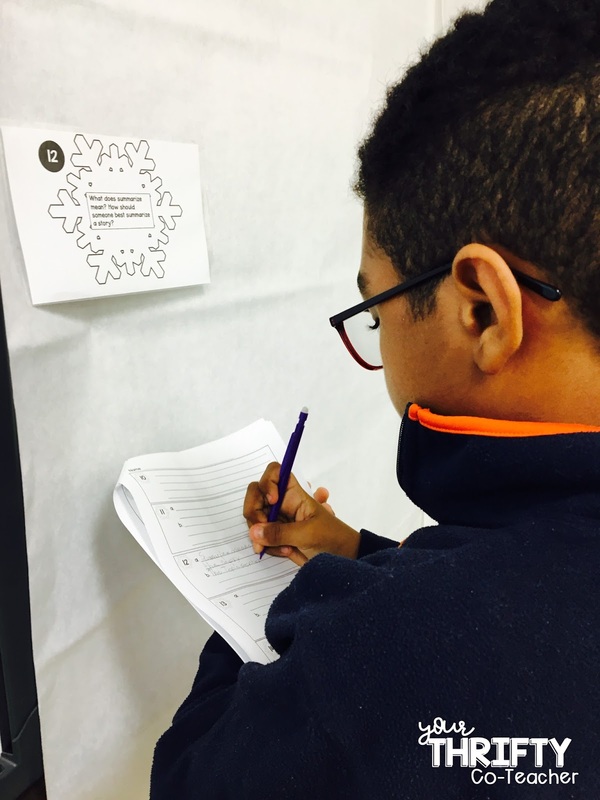 Students received crumbled up paper snowflakes with a prefix or suffix on it. They had to gather one snowflake at a time, take it to their desk, find the correlating number on their recording sheet, write the prefix or suffix on it, and then write its meaning. They then threw the snowball back into the middle of the room and grabbed another. They repeated this for seven minutes gathering as many suffixes and prefixes as possible. We then switched papers and reviewed the answers. Students counted how many questions their friend answered correctly and wrote the number on the top. 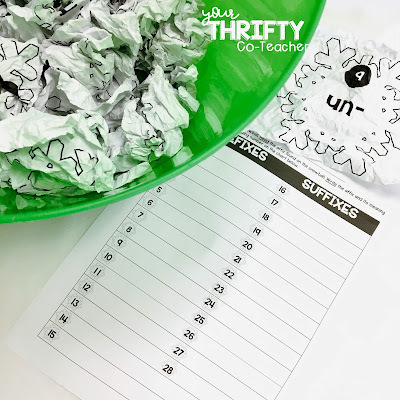 Make it your own by: writing your own questions or problems on sheets of paper to use as snowballs. Crumple them up and let the snowball fight begin. 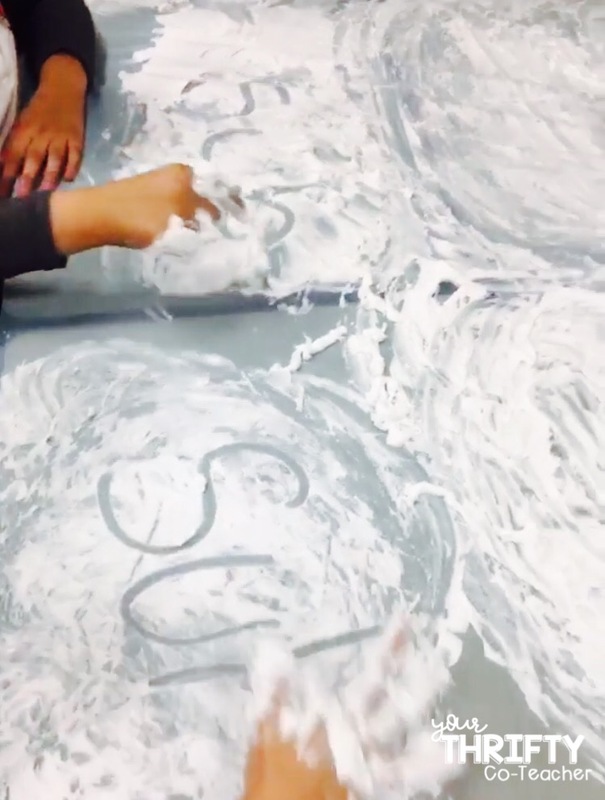 ACTIVITY THREE: WRITING IN THE "SNOW"
For the last activity, I asked them to sit at a desk and then proceeded to squirt shaving cream all over the blue table cloth. I was advised to use "original" shaving cream and not scented nor aloe based shaving cream because it could make their eyes sting if they accidentally touched their eyes. I purchased one small shaving cream bottle from Dollar Tree for every group of about four students and had a bottle or two left over. (This activity does not require tablecloths and can be done directly on the desks. However, since I am departmentalized and had another class coming in right after, I needed something that was super quick to clean up without an evidence left behind.) 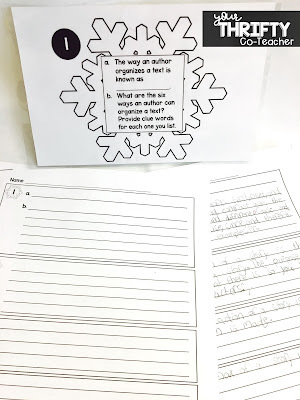 In order to further review affixes and roots, I would call out a definition and the students would write the correct affix or root in the "snow." They absolutely loved it since most of them had never experienced this before, or hadn't done so since kindergarten. Now, as an added part here, since I wanted to see who was remembering the affixes and roots, I created a quick seating chart, and then quickly (tally) marked who got the meanings of the affixes and roots correct. At the end, I quickly counted up the points for each student. 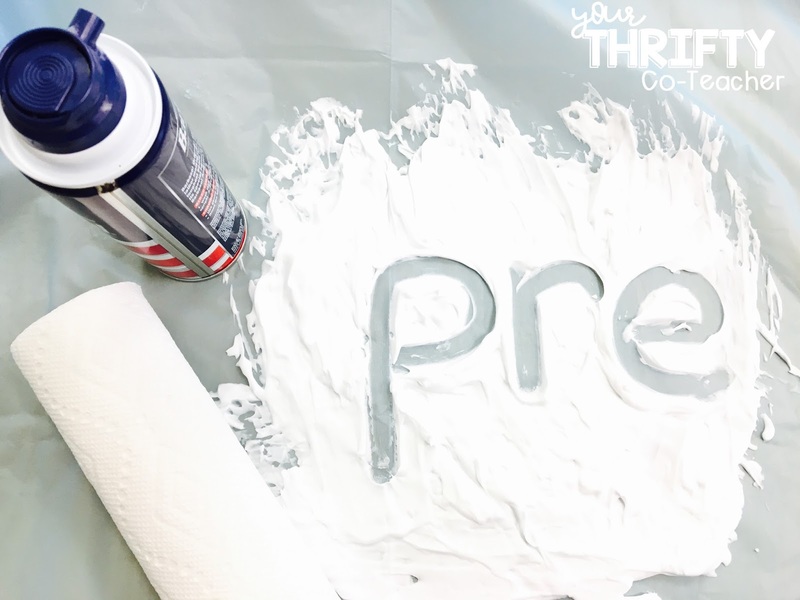 Make it your own by: using shaving cream for students to use when answering any questions or problems that can be answered with short responses such as multiple choice questions, math facts, affixes, etc. 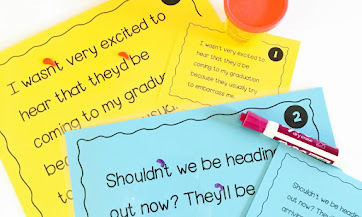 The following day, I gave each student another student's paper, and we went over the responses to the task cards. Students were only marking answers that were correct. They then wrote the number of correct answers on the top of the paper. We summed up the points for all three activities to see who the top students were. These students received a treat for their achievement. A GIFT FOR YOU. YES, YOU!! If you wish to implement this classroom transformation using the same resources I used, you can download it for FREE by clicking HERE. I hope this little gift will help motivate you to try a new classroom transformation. If you do, please let me know by commenting below, sending me an email, or finding me on Instagram. I would LOVE to see your version of a Winter Wonderland.